Ravi Velloor is an award-winning journalist and an Associate Editor of The Straits Times. He is best known for writing its influential ‘Speaking of Asia’ columns. He is a specialist writer on Asian macroeconomics, business and diplomacy. A 36-year veteran of the trade, he has reported from across Asia, and the US. 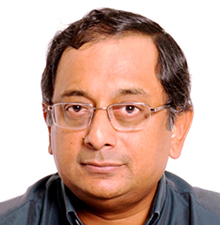 Formerly Foreign Editor and South Asia Bureau Chief of ST, A Jefferson Fellow, Ravi previously worked with Bloomberg News, Time Warner magazines, Agence France-Presse and United News of India. He is responsible for the Straits Times being recognized for its Asian coverage. Velloor's first book, INDIA RISING: Fresh Hope, New Fears, will be released by Emeritus Senior Minister Goh Chok Tong on April 21 in Singapore. This book is a collection of anecdotes and observations of the significant events that marked the decade of India’s Congress Party rule under Manmohan Singh (India’s Prime Minister from 2004 to 2014), culminating in the rise of the country’s current Prime Minister, Narendra Modi. Ravi's interests span diplomacy, geopolitics and global business.